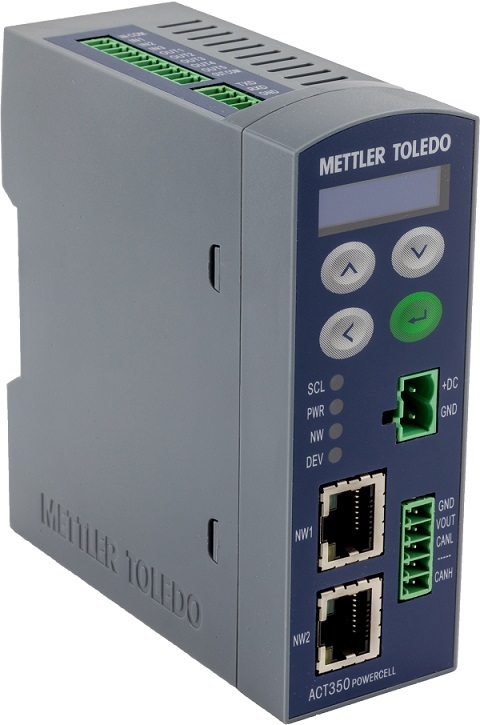 Mettler Toledo introduces the ACT350 DIO and ACT350 Powercell automation weight transmitters. Mettler Toledo introduces the ACT350 DIO and ACT350 Powercell automation weight transmitters to the ACT350 product family. Integration of analog and Powercell weighing systems into automation applications have never been easier. These new ACT transmitters provide enhanced network functionality and onboard I/O for direct local control of connected scales, load cells, and weigh modules in conjunction with PLC application control. * Fast PLC Integration: Supports fast PLC connectivity via add-on profiles and device description files – complete weight integration in minutes. * Media Redundancy: Dual Ethernet ports allow for daisy chaining and support media redundancy protocols. * Compact Housing: Small DIN-rail housing saves valuable cabinet space, and keys and display allow setup and control directly at the unit. * Powercell Load Cell Connectivity: Offers higher accuracy, better noise immunity, and overall visibility to the weighing process via condition monitoring than analog systems.